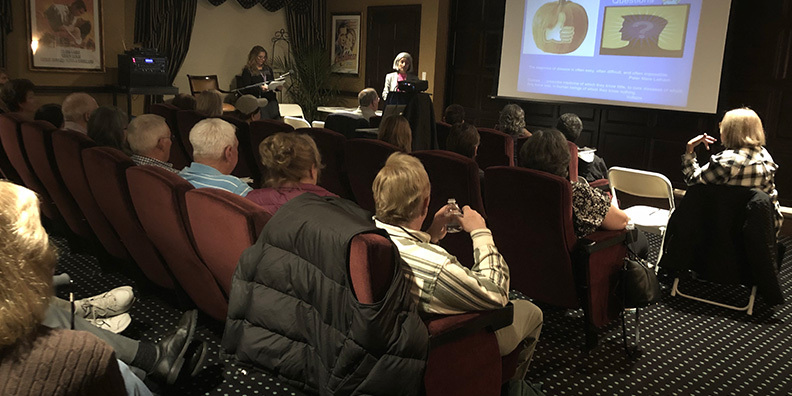 Mahwah, NJ — On Wednesday, November 7, 2018, Brandywine Living at Mahwah hosted distinct speakers from Valley Health System as part of their collaborative “Better Than Ever” program series. The program series allows the community to engage in a conversation about health with local experts in an open panel setting. This session’s topic titled, “A Lot to Digest”, addressed the impact of stress and other factors on digestive health. The expert panel included gastroenterologist, Sita Chokhavatia, M.D. and Health Educator, Susan Breithaupt, LCSW from Valley Health System. Dr. Chokhavatia is board-certified in internal medicine, gastroenterology and geriatric medicine, and has been practicing for over 30 years. Susan Breithaupt is a Health Educator for The Valley Hospital Community Health and Community Benefit Department with over 20 years of experience. Together they provided important information and helpful strategies to combat stress and anxiety, which are factors that can contribute to or cause abdominal pain and discomfort. They emphasized that no matter the cause, stress and anxiety can take a toll on people both mentally and physically. That’s especially true when it comes to our stomach and digestive system. Attendees had positive feedback about the program, which also featured an opportunity to mingle over delicious food, intimate Q&A session and a guided meditation wrap up. Brandywine Living looks forward to the next “Better Than Ever” session hosted in conjunction with their collaborative partner, Valley Health System.